Wholesale Personalized Desk -Kitchen Organizer -Caddy. Promotional, Inexpensive. Budget Prices in USA and Canada. 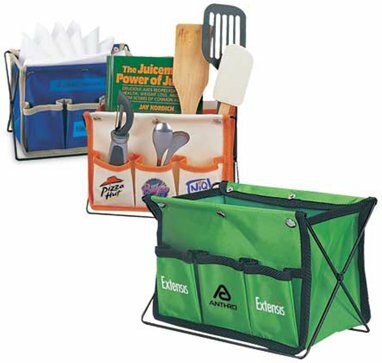 Desk or Kitchen Organizer -Caddy at the lowest prices in the USA and Canada. Made of 420 nylon with foldable metal frame and stand. Comes with 3 gusseted front pockets. 8 3/4" W x 6 1/2" H x 6" D. American clients pay no taxes. Free artwork design. Unit Prices below include your 1-color custom imprint in one location. Additional Color/Location: Add $45.00 set−up, plus 0.45 per piece, per color, per location. Set-Up Charge: $45.00 per imprint color. Material: 420 nylon with metal frame and stand. PACKAGING: Bulk; 40 units per carton. 36 lbs. per carton. PRODUCTION TIME: 10-14 working days after art approval.